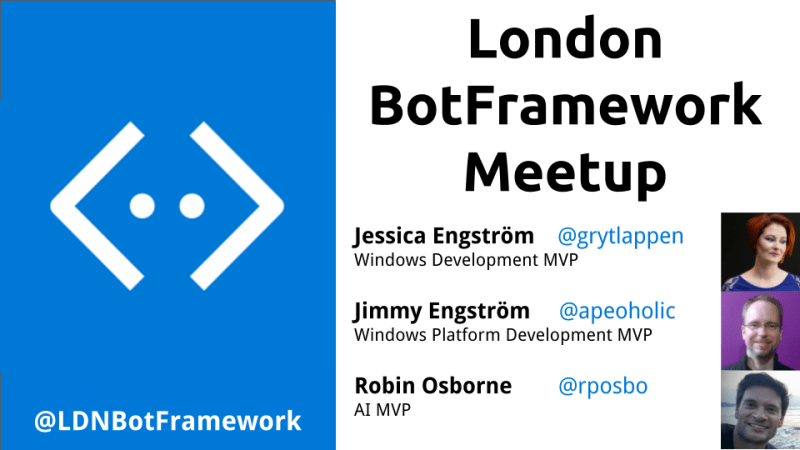 On the 16th January I had the pleasure of hosting another London BotFramework meetup at the newly constructed event space in the Just Eat offices. They’ve joined three floors with a staircase, so attendees can have beers and pizza upstairs while the presenters sweat with the AV equipment downstairs! There was a great turnout for this one, including the usual gang and a few new faces too. Before I get started, in case you haven’t already seen it, you should totally subscribe to the weekly Artificially Intelligent newsletter that has the latest news in AI, Chatbots, and Speech and Image Recognition! Go sign up for Artificially Intelligent! Just want to get stuck in? Here’s the video; first half is Jimmy, second half is Jessica. For this meetup we were fortunate enough to have the Engström MVP power team, Jessica and Jimmy, who were in town for NDC London and graced us with their presence. 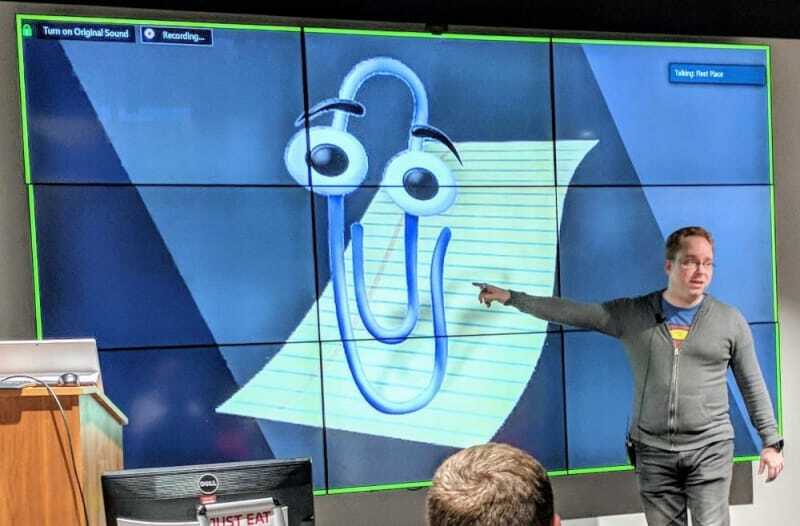 The first session included several fantastic live demos where Jimmy creates a simple chat bot and, with minimal development effort, gets it working on Alexa, Cortana, and Google Home! In the second half Jessica gave a great overview of creating a framework to ensure your bot – speech or text based – seems less, well, robotic! Some great takeaways from this which can easily be applied to your next project. Being a geek shows in all parts of Jessica Engström’s life, whether it be organizing hackathons, running a user group and a podcast with her husband, game nights (retro or VR/MR) with friends, just catching the latest superhero movie or speaking internationally at conferences. Her favorite topics is UX/UI and Mixed reality and other futuristic tech. She’s a Windows Development MVP. Together with her husband she runs a company called “AZM dev” which is focused on HoloLens and Windows development. The updated event space at Just Eat is great and gives better visibility of the sessions thanks to stadium seating at the back. The sessions were insightful and overall I think this went well. 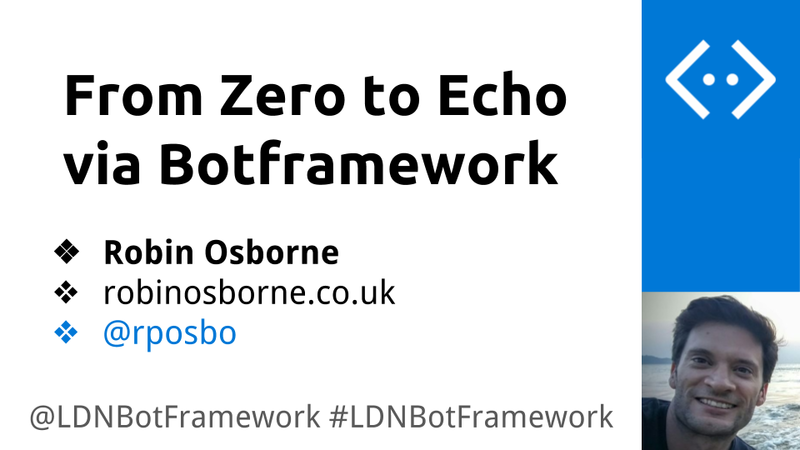 I had an awesome time presenting my session at the second LDNBotframework meetup! This time I ordered the correct amount of pizza, and let people loose on it at the right time; so no fridge full of pizza for breakfast the next day! Having scheduled this session weeks ago, unfortunately my preferred presenters were not able to make it; as such I had just over a week to decide what to do about the already scheduled meetup: should I cancel it and lose momentum, or should I do a session myself? 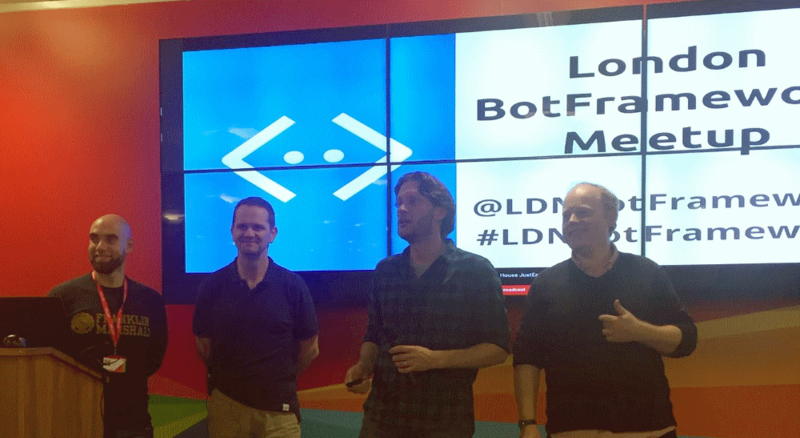 We recently wrapped up the first #LDNBotFramework meetup! There were a lot of lessons learned for me, as a first time meetup organiser, and overall I think it was a success. 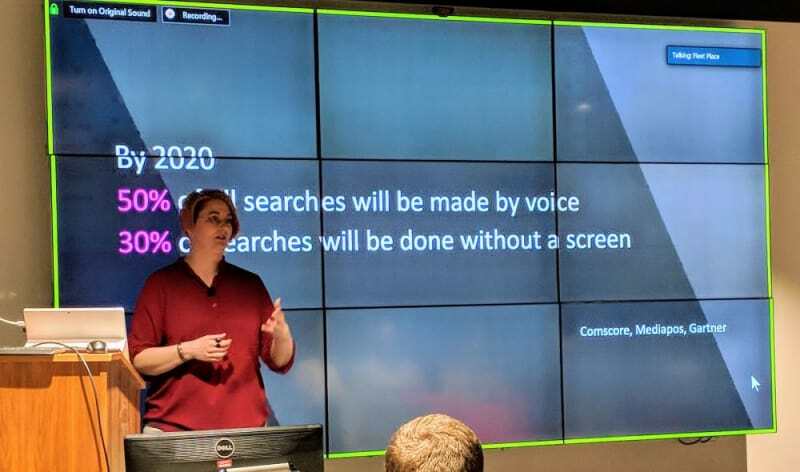 The venue was great; the big video wall in JustEat’s Fleet Place House office combined with a mic and speaker system that “just works”, a stocked beer fridge and far too much pizza, all made for a perfect tech meetup setup. Thanks to @beanbaglabs for this group pic! We were very lucky to have representation from Microsoft to kick things off, then some great insights from SkyScanner’s case study, finishing off with a lightning talk on user expectations from JustEat. If you’re one of the few people who have managed to avoid the onslaught of Chat Bot related articles over the past year, then let me start by way of an introduction; a chatbot is, in it’s most basic form, a computer program that can mimic basic human conversations. This isn’t particularly new or exciting; this sort of chat bot has been around since the 70s. What is new and exciting is the recent development in systems and frameworks which make creating your own chat bot easy enough that you can focus on the quality of the interaction with the end user instead of wallowing in the technical considerations. There is a website with a form to fill in that will give you a chat bot at the end of it, all the way through to an enterprise company’s framework for building your bespoke conversational interface from scratch.